Kitesurfing tours in Ireland with Ryan Coote as you Guide. Jump on board and let’s go! Experience a memorable kitesurfing holiday in beautiful Ireland. Be guided to beaches and reefs that are amongst the most amazing in Europe and the world. Ireland has some of the most scenic kitesurfing beaches in the world. Ok so you are not coming to Ireland for the sun but you might get lucky.! It is a smallish island and as conditions change we will chase the wind and find perfect wind and waves for whatever level you are kiteing at. Ryan has been touring up and down the Irish coast for over 18 years and knows every grain of sand and every secret beach and reef. We want to promote the kitesurfing lifestyle. You will be spending quality time together during your kitesurfing holidays and sharing experiences and harnessing the sheer power of nature with our kites is an integral part of this lifestyle to the sheer joy of kitesurfing. Being part of this lifestyle will ensure that you will have the most memorable kitesurfing holiday here in Ireland that you will remember for a long time - filled with sun, fun, wind, and waves …………………… and maybe a Guinness or two at the end of the day! Reviews from kitesurf Ireland on Tripadvisor check the link here. "Had a brilliant time touring around Ireland with Ryan. Well organized trip and explored a lot of hidden gems. I progressed a lot with my kitesurfing and wave riding skills. Overall a great experience that I look forward to doing again in the future. A big shout out to Ryan who always ensured everyone was safe and had a good time." "Ireland is just beautiful. And what a great place for kitesurfing. Ryan knows all spots and takes you to wherever conditions are best for riding. I never thought I would really enjoy waves but his enthusiasm, knowledge and tuition skills even made me buy a directional board. Definitely coming back again to really attack some waves! And to enjoy more of the beautiful nature, good food and drinks, and great company." "Ryan is an extremely patient instructor and his method of teaching is very effective (I was up and running by the end of the second lesson). Ryan runs a very slick, professional operation and I would describe him like an extremely positive, knowledgeable, and enthusiastic Air Traffic Controller as he has the ability to patiently talk you through every step of the lesson/kite flight (he even has a speaker system in his helmets which I found saved on huge amount of time). He also takes some pics and videos to help with your full understanding of the drills/exercises etc which is handy to draw on days and weeks after the lesson. Overall and most importantly, I would say that Ryan has given me the confidence to go Kitesurfing SAFELY. I highly recommend Kitesurfireland and a visit to the Dingle Peninsula. Life is too short life, not too….You won't be disappointed." "If you're looking for a guide to all the hidden gems of Irish wave kiting Ryan of Kitesurfireland is your man. If you're looking for an experienced instructor from beginner to pro-level in kiting he's your man too! I really enjoyed the time with him and all the variety Kitesurfing in Ireland has to offer." "This is how kite trips should be. I booked in for a week-long tour and got everything you would want from a kite trip. Amazing spots around the Dingle peninsula for all conditions and skill levels. With Ryan a guide who knows them all. He was not only our guide but also our teacher in all things wave kiting and we learned loads. Not just technique and how to stay safe out there but also the love for the ocean and the amazing playground wind and waves provide. Top that with good food and learning a thing or two about local history that is all I want from a kite trip. I‘ll be back for sure and will highly recommend the area and Ryan as a guide and teacher to whoever asks." "A group of friends and I recently took a weeklong kite tour of Ireland with Kitesurf Ireland and I can't recommend it enough. Ryan Coote is a world-class kitesurfer, fantastic tour guide, and all around good guy! He will take you to the best kiting spots (we traveled around NW Ireland because of a storm that brought the wind!) depending on conditions/skill level and is a wealth of knowledge on kitesurfing. I learned so much on our weeklong trip. He deserves the highest recommendation"
"Ryan puts on an amazing trip, with a perfect mix of sight-seeing and kitesurfing. His knowledge of the areas and how to kite them is unbelievable. He pays attention to everyone's interests and makes adjustments to the tour on the fly to accommodate. Highly recommended if you ever had an interest in kiting Ireland. Five stars!" "Ryan is a world class kiter and a first class tour guide. He went above and beyond to accommodate the needs of everyone on the tour, from finding the right riding conditions to booking the right accommodations. 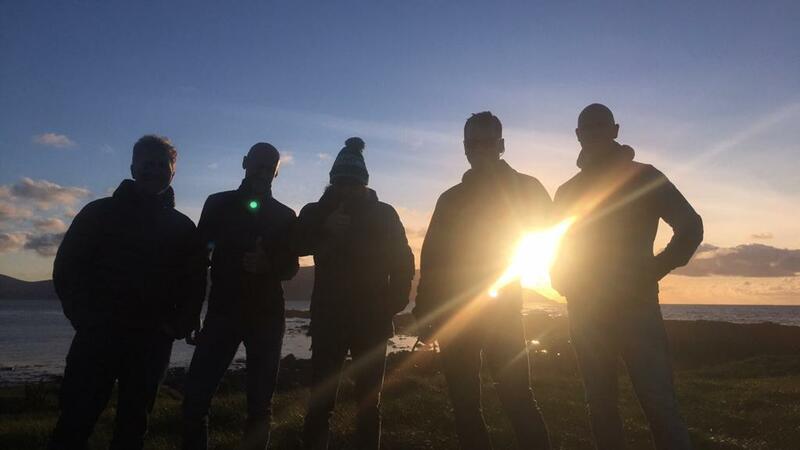 5 of us spend 6 days in a van traveling to remote points in Belmullet to the popular reefs of Bundoran. Ryan managed the group with expert hospitality and limitless geniality. If your going to kitesurf Ireland this is an amazing way to do it." "Under the ever watchful eye of Ryan (usually floating 40ft above me), I enjoyed an incredible 5 days of wave riding and jumps in my favorite place in the world. He is a true Waterman with a wealth of knowledge and respect for the whole coast of Ireland and all its conditions. I didn't go for lessons, but lessons I got. Everything from Kitesurf survival to wheatgrass smoothies. The only thing as good as the kiting was the banter. Thanks again, Ryan. Can't wait to get back." "Had some amazing coaching with Ryan! We went to different spots every day looking for the best conditions to kite. I also had a cultural experience from this beautiful part of Ireland thanks to Ryan! Overall would 100% recommend!" We had a fantastic week with Ryan. Every day we went to a new spot, chasing waves and wind. Every day a new sensation of magnificent waves, beaches, and beautiful unspoiled nature. Ryan is the perfect guide for this amazing road trip and will do anything to make you happy. After this trip, we all decided that we would come back to Ireland and to Brandon Bay. Keep on surfing Ryan you are the best. One of the things about the Dingle peninsula is that there are not loads of people who surf or kitesurf - and the conditions and locations are great for it. Take the wind and a bit of rain and boom - you have a sport that you can do in the Irish weather! I got started learning to kitesurf last weekend, and I am hooked. Ryan, the owner of the business, is a great mix of laid-back but meticulous, making sure that you learn how to rig your own equipment, understand the wind, and learn your basic skills of kite control before you progress to new skills and advancements. He also progresses you through different sizes of kites and lines as you do this, which keeps things challenging as well as great fun. Kristian came on tour. I think he enjoyed himself a lot. All transport to beaches is included in the cost. Transport to activities other than kitesurfing -such as mountain biking, climbing or fishing – can be arranged at an additional cost. There will be plenty of time to discuss these options on the day. IRELAND IS THE LAND OF CIAD MILE FAILTE meaning 100,000 WELCOMES in the Irish language. We will be sampling that welcomes the local guest houses and B&B around Ireland. As we will be chasing the swell and the wind all day, when night falls you will be driven to your resting place where you will be watered and fed and rested, ready for the next day’s riding. Date Info & Prices: 2019 Tours. *Airport picks up and Drop Off Available in Kerry KIR, Shannon SNN, Cork ORK, Train to pick up Kerry, Cork, Limerick, Mallow. Dublin airport pick up can be arranged at an added cost. Please get to pick up location a day before to allow for flexible pick up Times for people. Send email if you would like to be updated on in Info and dates. Come join me on a windy, wavey, adventure across the world. Sample new oceans, feel the power of the surf and energy in the wind. Join 5 other like-minded Kitesurfers adventures who like to Ride waves and explore there world. kitesurfing/laughing/Biking/Fishing/eating/drinking/hiking or maybe just seating by supping a cool pint of Stout watching the world go by.